The game will start shortly. Make your way through five levels of goals in Lottso! Express HD. Match Lottso! ball numbers on the gameboard to win scratcher cards, boost your score and advance to bigger and more rewarding goals. Enjoy relaxing single player action, with no timers and no rush. 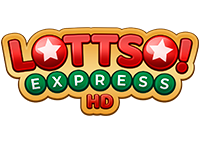 Unlock scratcher card sets as you play Lottso! Express HD. You start with only 30 balls, so choose wisely. Reach goals to gain extra balls. There’s a lot to Lottso! Express HD. Play through 5-30 rounds of scratcher cards. Fill adjoining cards to unlock Super Lottso! And Mega Lottso! cards to score more points! To place a ball, you can either drag it where you want it to go, or simply select a numbered hole on the gameboard. For example, the number 1 ball can be placed in a 1 hole or any Free hole. Free holes accept any number. Star balls are wild and can go anywhere. The 6x6 gameboard is divided into different 3x2 trays. Fill up one of these trays to earn a scratcher. Scratchers earn you extra points when you scratch them. You can increase the amount of points by placing balls in the multiplier holes attached to each scratcher. You can also earn points by completing bingos by row, column or diagonally, using all 6 balls. Lottso! Express HD has five levels of goals. You reach each goal by filling the score bar. When you reach the goal, you get 30 extra balls. When you are done placing balls for a round, you can press the Refill button to get a new rack of 6 balls. Any unused balls will be discarded when you press the button, so be careful. The game ends when you run out of balls. There is no timer, so play at your own pace and have fun! The Undo button can be used if you haven’t refilled, earned extra balls, or scratched a scratcher. There is no penalty for using it. The Bronze, Silver and Gold cards appear at the same frequency. Bronze cards pay less, but are easier to complete and multiply. If you have to choose between multiplying a Gold card or a lesser tier, always go for Gold since it’s usually worth more. The frequency of all the balls is the same, so if you have to pick where to put a star ball, cover up numbers that are more common. Put star balls on lower-numbered holes. You’ll score 10 points for the star ball, more than you’d get putting a low-numbered ball in a low-numbered hole. Remember that you get 50 bonus points for using all the balls in the rack in Lottso! Express HD. Try to set things up to ensure you can use all the balls. Mega Lottso! can deliver a lot of points, so consider waiting to click the scratchers until you can do them all at once.